Mahmoud Abbas today is in the terrible grip of the second phase of the Oslo accord of 1993, also known as “the peace process”. Many, including myself, have written about the death of this agonizing process, but in reality, it is not dead; it is very much in progress as scripted. The epic tragedy of the “Peace Process” is not over until Abbas sings. Some years ago, Abbas’s political script was accepted, albeit reluctantly, by a majority of West Bankers. 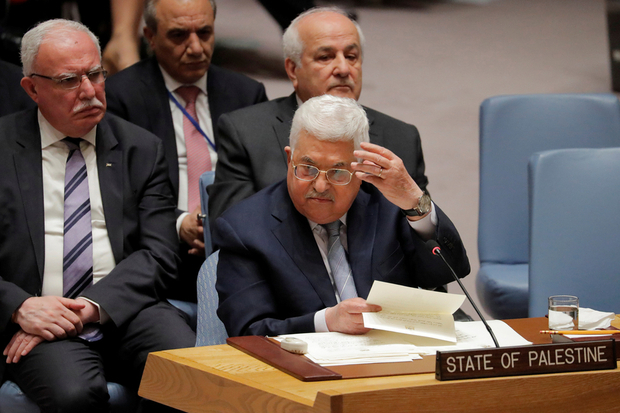 It was a script imposed on Abbas by the so-called peace process, which was hammered out in total secrecy and which dictated a two-state “solution” as the only permissible solution to the problem created by the violent partitioning of historic Arab Palestine in 1948. Illegal annexation of Arab East Jerusalem is now recognized by the U.S.
Jewish settlements in the West Bank? And Who profits from keeping Gaza on the brink of humanitarian catastrophe? Palestinian claims to land and property? Over Israel’s dead body – literally. Polls by the Palestinian Centre for Policy and Survey Research (PCPSR) clearly indicate how discredited Abbas’s political agenda has become.